For all those that read the part one to ‘Tips to Gaining Success in PPC’, you will realise that the term ‘success’ is very general when applied to pay per click advertising. There are different ways you can gain success depending on what you define as success. Already, I have described how to gain success when success is CPC success. 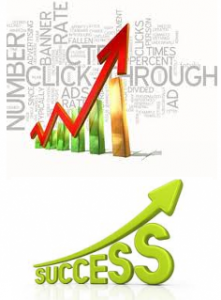 Now, I will be looking at a different kind of success in pay per click being CTR (click through rate) success. The click through rate is the percentage of clicks from the amount of impressions the advert has had. Ultimately, an advertiser will want the CTR of their campaign to be as high as possible. This is because it will make the results be instant and the campaign run more efficiently. If it is taking less impressions for the same amount of clicks, campaigns that follow CPM will run better due to cheaper variable costs. However, in what way can you increase the CTR in a PPC campaign to gain CTR success? One of the best ways to increase the CTR of a campaign is through optimising your advert to encourage clicks. One way of doing this is by using some of the ‘power words’ in the English language. These are words which have the biggest impact to the reader when reading (in a positive way that is). They are words which are stereotypically associated with positive thoughts providing ammunition for the reader to click on the advert. The words are as follows: You; Money; New; Save; Results; Easy; Health; Safety; Love; Discovery; Proven and Guaranteed. Therefore, try to use power words in your advert to increase it’s CTR. With a normal article, it would stop there leaving you with the thought that you should include power words in your campaign’s advert. However, there are more questions you need to ask in order to use power words. How many power words should you use in an advert? How should I use power words? Where should I use them in a text advert? These are some of the questions which need to be answered in order for you to use power words in your campaign correctly and to it’s full benefit. How many power words should you use in an advert? A typical text advert uses one title, two lines for the description and a URL link on the bottom. You are quite restricted to how many words you can use in an advert so pick wisely. For this reason also, I would only advise you to use 1-2 power words. Using too many will give you less characters to work with in your campaign. As well as this, people will start to view your advert as ‘too good to be true’ due to the amount of power words it has. How should I use power words? Compliment your advert with power words: don’t base your advert around using power words. The power words listed above have many similes which mean exactly the same thing. Therefore, look to replace less powerful words in the English with words from above. Where should I use them in a text advert? Power words should only be used in the title and description of a text advert. As I have already described in a previously article, the URL part of the text advert should stay at being a domain name (but don’t feel this is a restriction!). The best layout to an advert is to include one power word in the title and one in the description. This spreads out the power words evenly in the advert. From this, you should gain proven results to your PPC campaign which will achieve you a higher CTR, guaranteeing you money. See how influential power words can be?